A new animated movie and series will be featuring DC Comics’ biggest super-team, just in time to tie-in to Batman vs. Superman: Dawn of Justice. Don’t worry: Kevin Conroy will be doing Batman again on the new TV show. First up is a new movie that pits the Justice League and Teen Titans against each other will be coming out digitally on March 29 and on disc on April 12. This classic match-up has happened plenty of times in the past but Justice League vs. 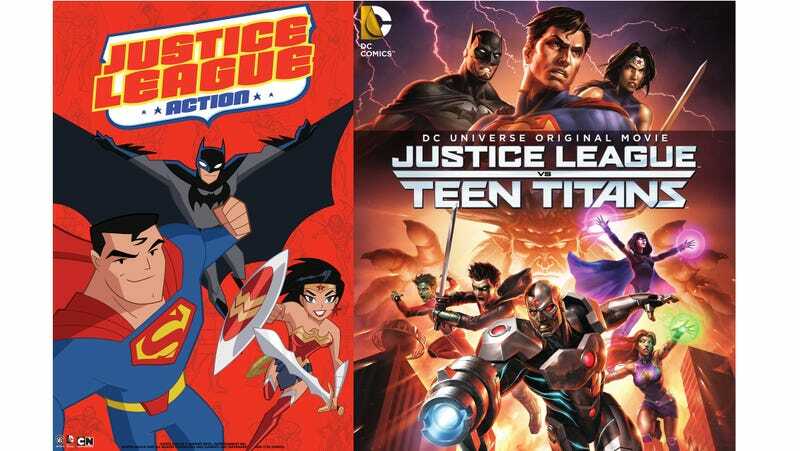 Teen Titans will use the newer versions of two teams. Batman, Superman and Wonder Woman lead the DC Comics Super Heroes against their most infamous foes in adventures packed with relentless thrills, fun and action. No need to wait for the good stuff to start, each eleven-minute episode jumps in with lightning-paced action and heroics. Whether defending the Earth, facing invaders from space, or battling the bizarre forces of magic, the always-rotating team of Justice League heroes, are up to any challenge. Justice League Action, which has no airdate yet, is in the unenviable position of coming after one of the best superhero shows ever. But the mention of a rotating cast gives me a little hope that it’ll capture at least a little of what made Justice League Unlimited so great.